"The only way to do this... with family and God. Thank you all for your wishes and blessings," read Priyanka Chopra's caption for the pictures she just posted from her roka ceremony with Nick Jonas. One of them is an adorable picture of Priyanka and Nick with both their families. Priyanka, her mom Madhu Chopra, brother Siddharth and Nick, his parents Kevin and Denise are seated together and cheerfully pose for the cameras. Priyanka and Nick, who were believed to have got engaged in July on her birthday in London, made their relationship official today. 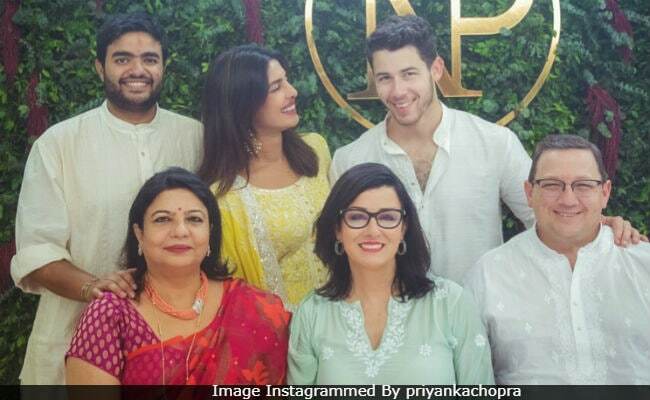 The roka ceremony was hosted at Priyanka's home in the afternoon and the traditional ceremony was attended by family members and close friends only. Take a look at Priyanka's post here. (Swipe right to see more pictures). After the festivities were done, Priyanka and Nick shared identical posts on Instagram to announce their engagement. "Taken.. With all my heart and soul," wrote Priyanka and Nick posted it a cute caption that reads as, "Future Mrs Jonas. My heart. My love." Congratulatory messages from Ranveer Singh, Alia Bhatt, Varun Dhawan, Hrithik Roshan, Shraddha Kapoor and other celebrities are pouring in for the newly-engaged. Nick Jonas also left a comment on Priyanka's post. Yes, he did. Priyanka Chopra and Nick Jonas' engagement party was held later in the night. Priyanka Chopra, 36, and Nick Jonas, 25, first met at last year's Met Gala. They reportedly began dating a few months ago. The couple haven't announced a wedding date yet.